A sleek, sports inspired TAG Heuer timepiece from the Carrera collection. 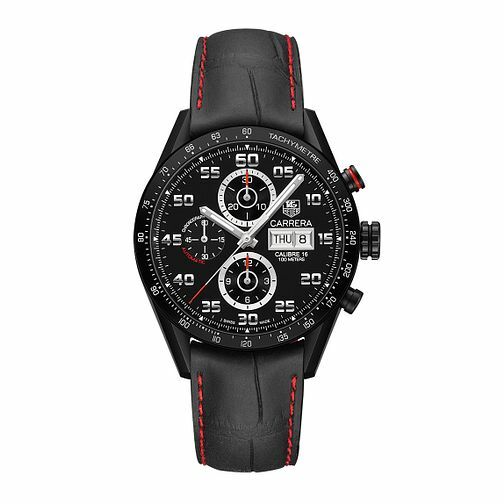 Featuring a black leather red stitched strap and set on an ion-plated case, a bold black tachymeter bezel frames the chronograph dial, complete with date window, sub dials, and the iconic TAG Heuer logo. Sophisticated sports timekeeping, excelling in style and function. TAG Heuer Carrera men's ion-plated black strap watch is rated 4.0 out of 5 by 1. Rated 4 out of 5 by Anonymous from Beautiful Tag Heuer Carrera This is one of the most beautiful watch by Tag Heuer. I do own several other watches such as Rolex, AP, Hublot, RM etc but now I am completely in love with it.